This Persistence Market Research report examines the Wearable Injector Market for the period 2018 – 2026. The primary objective of the report is to offer updates and insights regarding the various market opportunities in the global wearable injector market. The technology of drug delivery system has evolved in the recent years from multiple daily injections to wearable injectors, where the drug is administered into the body with the help of a needle. The wearable injector is a hands free, easy and simple-to-wear device, which delivers high- & low-volume and viscous drugs. The needles of the wearable injector are never exposed, which reduces the chance of infections. The wearable injector market is segmented into body-worn patch injectors and off body-worn injectors. The off body-worn injectors are applied to the body with the help of belts while the body- worn patch injectors are adhesives. The wearable injectors delivers the drug into the body at basal and bolus rates. Prevalence of chronic diseases such as cardiovascular diseases, diabetes, and arthritis is increasing rapidly, which will require self-administration in cases of emergency. Moreover, the wearable injectors measure the dosage a patient requires and reduce the risk of needle stick injuries. Appropriate amount of drug can be delivered to the patient at appropriate time by using wearable injectors without the involvement of healthcare professionals. The shortage of healthcare professionals, such as doctors and nurses, is expected to upsurge the demand for wearable injectors over the forecast period. The growth is expected to be noticeable in the diabetes indication segment. Furthermore, the wearable injectors have been manufactured for the treatment of cardiovascular diseases and cancer treatments. Amgen manufactures Repetha, which is responsible for lowering the LDL (Low-density lipoprotein) in patients suffering from Heterozygous Familial hypercholesterolemia (HeFH ). To provide an accurate understanding and to assess the opportunities in this market, the report is categorically split under three sections, namely market analysis by product type, distribution channel and regions. The report analyzes the global wearable injector market in terms of market value (US$ Mn). The report starts with an overview of wearable injector and its usage in regions across the globe. In the same section, PMR covers the wearable injector market’s performance in terms of revenue. This section includes, PMR analysis of key trends, drivers and restraints from supply side and demand side perspective. To arrive at market size, the report considers company share analysis for the majority of the companies, which include 60% share from the geographies. The forecast presented here assesses the total revenue of the wearable injector market. When developing the market forecast, the starting point is sizing the current market, which forms the basis for the forecast of how the market is expected to take shape in the near future. Given the characteristics of market, we have triangulated the outcome based on different analysis based on supply side, demand side and GDP growth rate. However, quantifying the market across aforementioned segments and regions is more a matter of quantifying expectations and identifying opportunities, rather than rationalizing them after the forecast has been completed. As previously highlighted, the market for wearable injectors is split into various sub-segments based on region, product type and distribution channel. All these sub-segments or categories have been analyzed to understand individual segments’ relative contribution to the growth. This detailed level of information is important for identification of the many key trends in wearable injector market. Also, another key feature of this report is the analysis of wearable injector market by regions, product type segments and distribution channel. Its revenue forecast in terms of absolute dollar value. This is traditionally overlooked while forecasting the market. However, absolute dollar opportunity is critical in assessing the level of opportunity that a provider can look to achieve, as well as to identify potential resources from a sales perspective. Furthermore, Persistence Market Research has developed market attractiveness index for all three segments – regional, product type and by distribution channel segments. This index helps in identifying the real opportunities available in the market. In the final section of the report, the wearable injector market landscape is included to provide report audiences with a dashboard view, based on categories of providers across the market, presence in wearable injector product portfolio and key differentiators. Examples of some of the key players operating in the global wearable injector market include Medtronic Plc, West Pharmaceutical Services, Becton, and Dickinson And Company, ypsomed, Valeritas,Inc, Dexcom, Inc., Amgen Inc., Enable Injections, Consort Medical and Insulet Corporation. Wearable injectors are also called patch pumps or patch injectors that are responsible for the delivery of drugs. These wearable injectors have been evolved from the traditional syringes, and are designed to make the treatment easier with its single-step delivery mechanism. The device helps to control the disease in the patients and delivers the drugs faster and safer manner in the body through subcutaneous tissues. The wearable injectors have open the door for the patients suffering from cancer, cardiovascular diseases, diabetes and rheumatoid arthritis. The wearable injectors deliver large-volume and viscous drugs, which were previously difficult by vials and syringes. Moreover, wearable injectors are user friendly and they reduce the need of multiple painful injections. The wearable injector offers convenience to the patients by reducing the hospital visits. The conventional insulin pumps or CGM are large in size and thus, people have social and psychological stigma towards opting for such devices, while wearable injectors are compact and small and adhere to the skin of the patient. The wearable injector does not require a doctor or nurse to deliver the drug and also to monitor the medication of the patient. The chances of error with wearable injectors are almost negligible during delivery of a particular dosage. On the basis of product type, the wearable injector market is segmented into body-worn patch injectors and off body-worn injectors. The off body-worn injectors are applied to the body with the help of belts while the body worn patch injectors come with an adhesive which sticks to the body. The needle in the device is retractable. The device can be easily disposed of once the required dosage is subcutaneously delivered to the patient. The body-worn patch injector segment is expected to grow at a significant CAGR during the forecast period. The wearable injector provides automation for drug delivery, for instance wearable insulin pumps such as the MiniMed by Medtronic injects the insulin into the body at basal or bolus rates. Throughout the day the machine injects small amount of insulin in the body. The wearable injector has a sensor, as the level of insulin goes down or increases the sensor gives a warning signal. On the basis of distribution channels, the global wearable injector market is segmented into hospitals pharmacies, retail pharmacies and online sales. Increasing demand for minimal invasive treatments is expected to bolster the overall growth of the wearable injector market globally. The global wearable injector market was valued at US$ 3,329.5 Mn in 2017 and is expected to expand at a CAGR of 13.7% over the forecast period (2018–2026). The growth of the global wearable injector market is mainly driven by high prevalence of diseases such as diabetes, cancer, cardiovascular diseases and advancement of technology with tracking devices, which can monitor the health of the patient. Furthermore, increasing demand for less or painless devices is also expected to surge the growth of the market for wearable injectors. The global wearable injector market has been segmented on the basis of regions into North America, Latin America, Europe, and Asia Pacific excluding Japan (APEJ), Japan and Middle East & Africa (MEA). In terms of revenue, North America is projected to be the dominant regional market for wearable injectors throughout the forecast period as manufacturers in the region are developing products that have the potential to treat diseases, such as diabetes, beforehand with transmitters, which transmit the drugs during the high or low levels of insulin in the body, and sensors, which alerts the patients about it. Latin America and APEC are expected to witness significant growth during the forecast period as numerous research and development activities are been carried out for rapid drug delivery by wearable injector devices. U.S. dominates in North America market due to a large patient pool suffering from diseases such as diabetes and cancer. The U.S., Japan, Germany, the U.K. and China contribute a major share in the global wearable injector market. 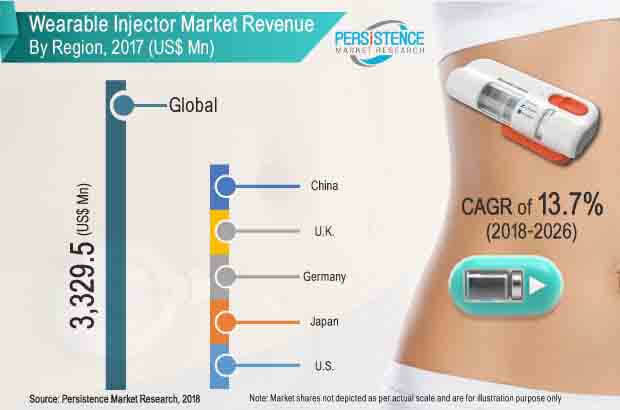 A large number of players operating in the wearable injector market are focused on entering into collaborations and partnerships with local distributors and retailers in order to enhance their market presence globally. Moreover, it also enables companies to increase product visibility across different regions.